Objective To quantify the risk of future cardiovascular diseases, cancer, and mortality after pre-eclampsia. Data sources Embase and Medline without language restrictions, including papers published between 1960 and December 2006, and hand searching of reference lists of relevant articles and reviews for additional reports. Review methods Prospective and retrospective cohort studies were included, providing a dataset of 3 488 160 women, with 198 252 affected by pre-eclampsia (exposure group) and 29 495 episodes of cardiovascular disease and cancer (study outcomes). Results After pre-eclampsia women have an increased risk of vascular disease. The relative risks (95% confidence intervals) for hypertension were 3.70 (2.70 to 5.05) after 14.1 years weighted mean follow-up, for ischaemic heart disease 2.16 (1.86 to 2.52) after 11.7 years, for stroke 1.81 (1.45 to 2.27) after 10.4 years, and for venous thromboembolism 1.79 (1.37 to 2.33) after 4.7 years. No increase in risk of any cancer was found (0.96, 0.73 to 1.27), including breast cancer (1.04, 0.78 to 1.39) 17 years after pre-eclampsia. Overall mortality after pre-eclampsia was increased: 1.49 (1.05 to 2.14) after 14.5 years. Conclusions A history of pre-eclampsia should be considered when evaluating risk of cardiovascular disease in women. This association might reflect a common cause for pre-eclampsia and cardiovascular disease, or an effect of pre-eclampsia on disease development, or both. No association was found between pre-eclampsia and future cancer. Changes during healthy pregnancy include insulin resistance,5 hyperlipidaemia,6 hypercoagulability,7 inflammation,8 and a hyperdynamic circulation9. These are exaggerated in women with pre-eclampsia and some are also features of the “metabolic syndrome” a “risk factor” for cardiovascular disease.10 It is possible that pre-eclampsia increases risk of later cardiovascular disease,11 either because of a shared cause or because subclinical vascular damage occurs during pre-eclampsia. If a history of pre-eclampsia exerts an independent risk for future cardiovascular disease it may increase the risk of cardiovascular disease in mid-life in affected women, which would render them eligible for preventive therapies at an earlier age than usual. To investigate the association between pre-eclampsia and atherosclerosis in later life we carried out a systematic review and meta-analysis of studies that had estimated the risk of arterial and venous diseases after pre-eclampsia. We also evaluated the risk of future cancer after pre-eclampsia, in particular breast cancer, one of the commonest causes of death in middle aged women.13 14 Finally we investigated mortality from any cause after a pregnancy affected by pre-eclampsia. We searched Medline and Embase with no language restrictions up to December 2006. Additional eligible studies were sought by a hand search of reference lists from primary articles and relevant reviews. (See bmj.com for search terms and combinations). We included prospective and retrospective cohort studies assessing women of any parity or age or with any severity of pre-eclampsia. To minimise selection or recall bias we excluded case-control studies. We defined a cohort study (including nested case-control and case cohorts) as one that identified pre-eclampsia as the risk factor under investigation and aimed to identify incident disease as the outcome. Two assessors (LB and JPC) evaluated each included full text article independently and extracted and tabulated all relevant data. Inconsistencies were checked and settled by consensus with all four authors. For additional reports relating to the original cohort, we included the report with the most information relevant to the study question. We contacted seven authors from six of the included studies w8w13w15 w16w20w22 and received additional unpublished data on numbers of exposed women, incident cases of cardiovascular disease and cancer, and relative risks for studied outcomes. All procedures and reporting conformed to the meta-analysis of observational studies in epidemiology guidelines.18 We excluded 13 unsuitable studies—one with no incident cases in study groups of women who had had pre-eclampsia compared with those who had not had pre-eclampsia, four that reported blood pressure only for both study groups together at follow-up, and eight without control populations. We utilised the inverse variance weighted method to obtain summary relative risks and 95% confidence intervals, using random effects models for all analyses. The extent of adjustment for confounding carried out at the level of individual studies was recorded and tabulated. We evaluated small study bias for each outcome by visualisation of funnel plots and an Egger test (by regressing the log relative risk against its standard error; see bmj.com for funnel plot analyses). For each outcome we calculated a weighted mean follow-up in years. We used Revman 4.2.7 and Stata 9.0 for statistical analyses. Heterogeneity was assessed by Q test and I2 tests. We explored sources of heterogeneity between study groups by evaluating the robustness of the estimate of the effect according to prespecified subgroups by parity, severity of pre-eclampsia, and severity of disease outcome. Instead of generating quality scores for included studies (a controversial approach in synthesis research), we extracted relevant study characteristics for definition of exposure, outcome, sample size (number of incident cases), and degree of confounding, and we used these in a sensitivity analysis. Overall 117 full text articles were identified. Thirty eight studies met the inclusion criteria, of which 25 were included. These studies included 29 495 incident cases of cardiovascular diseases and cancers among 3 488 160 women, of whom 198 252 had pre-eclampsia and over 3 million did not (comparator group; fig 1⇓). In 13 studies (21 030 women) fulfilling the criteria for risk of future hypertension, 1885 of 3658 women who had pre-eclampsia developed chronic hypertension in later life (table 1⇓).w1-w13 The mean weighted follow-up was 14.1 years. The relative risk of a later diagnosis of hypertension in women after pre-eclampsia was 3.70 (95% confidence interval 2.70 to 5.05) compared with women who did not develop pre-eclampsia. Significant heterogeneity was observed (P=0.001, I2=62.6%; fig 2⇓), with evidence that small studies reported larger effect sizes (Egger test, P=0.014). In analyses stratified according to the total number of cases, a smaller risk for hypertension (2.37, 2.11 to 2.66) was obtained after pooling the two large studies, each with more than 200 cases, compared with the risk from pooling 11 small studies, each with fewer than 200 cases (4.43, 3.24 to 6.05). Analysis according to parity indicated a higher relative risk of hypertension after pre-eclampsia in any pregnancy (four studiesw2w5w10 w11; 5.96, 3.42 to 10.38) compared with pre-eclampsia in the first pregnancy only (nine studiesw1w3 w4w6-w9w12 w13; 3.23, 2.32 to 4.52; χ2=8.48, P=0.004). Eight studies (2 346 997 women) contributed to the analysis of fatal and non-fatal ischaemic heart disease (table 2⇓),w8 w13 w19 with 121 487 women having had pre-eclampsia and 5097 ischaemic heart disease events. The weighted mean follow-up was 11.7 years. The relative risk of fatal or non-fatal ischaemic heart disease in women with previous pre-eclampsia was over twice that of women who had not developed pre-eclampsia (2.16, 1.86 to 2.52). No substantial heterogeneity was observed (P=0.21, I2=27.1%; figs 3⇓ and 4⇓). The Egger regression test showed no evidence of small study bias (P=0.59), and no clear asymmetry was observed in the funnel plot. 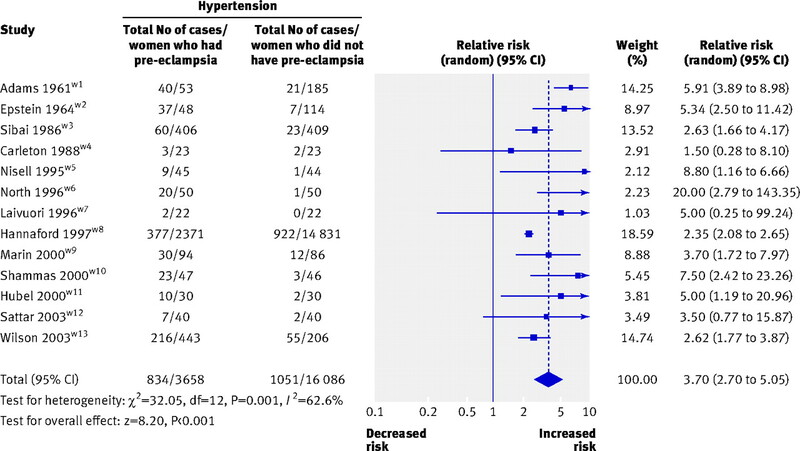 Six studies assessed primiparous women with pre-eclampsiaw13-w16 w18 w19 and two assessed women with pre-eclampsia in any pregnancy.w8 w17 The risks of ischaemic heart disease were similar in both groups: for primiparous women with pre-eclampsia the risk was 1.89 (1.40 to 2.55) and for women with pre-eclampsia in any pregnancy the risk was 2.23 (1.21 to 4.09; fig 4⇑). The risk of future fatal ischaemic heart disease events was increased in women after pre-eclampsia. In four studiesw13w15-w17 a summary relative risk of 2.60 (1.94 to 3.49) was identified for a fatal event. 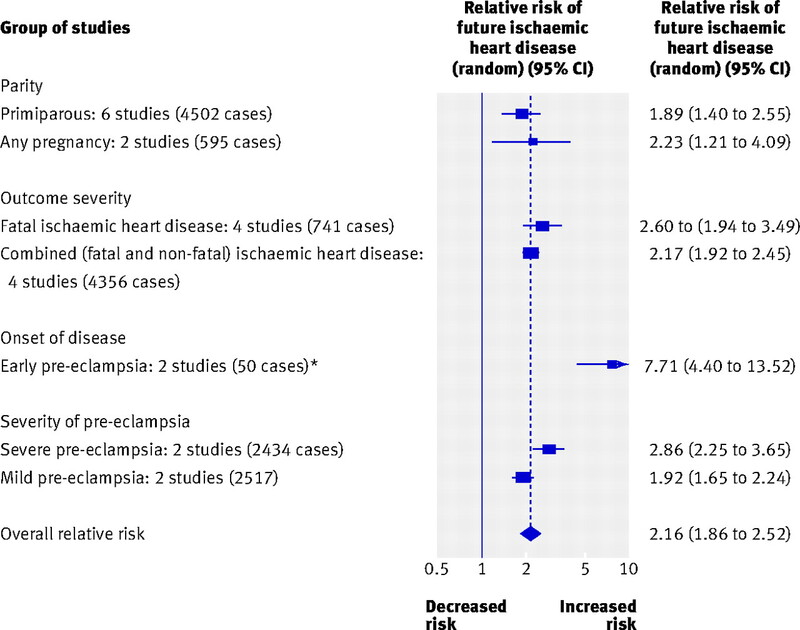 Four other studies included fatal and non-fatal ischaemic heart disease as their outcome after pre-eclampsiaw8 w14 w18 w19 (relative risk 2.17, 1.92 to 2.45; fig 4⇑). In two studiesw15 w16 pre-eclampsia before 37 weeks' gestation was associated with nearly an eightfold increased risk of ischaemic heart disease (7.71, 4.40 to 13.52) compared with women with normal blood pressure completing pregnancies after 37 weeks' gestation (fig 4⇑). The severity of pre-eclampsia also increased the risk of later ischaemic heart disease but not to the same extent as the gestation of onset. Two studiesw14w19 showed that women with severe pre-eclampsia (blood pressure >160/110 mm Hg plus proteinuria >0.3 g/24 hw14 or diastolic blood pressure >110 mm Hg plus proteinuria >5 g/24 hw20) had a greater risk of later ischaemic heart disease (2.86, 2.25 to 3.65) compared with women with mild pre-eclampsia (1.92, 1.65 to 2.24; fig 4⇑). Four studies (1 671 578 women) were included involving 64 551 women who had pre-eclampsia and 907 incident strokes (table 3⇓).w8w13w15w18 The mean weighted follow-up was 10.4 years. The overall risk of fatal and non-fatal stroke after pre-eclampsia was 1.81 (1.45 to 2.27) compared with women who did not develop pre-eclampsia. No heterogeneity was observed (P=0.51; I2=0%; fig 5⇓) and no evidence of small study bias was found (Egger test, P=0.82). Two studies reported on the risk of fatal strokew13w15 and three examined non-fatal events.w8w13w18 The risk of fatal stroke was greater than the risk of a non-fatal event after pre-eclampsia (2.98, 1.11 to 7.96 and 1.76, 1.40 to 2.22). Three studies (427 693 women) involving 35 772 women with pre-eclampsia and 470 incident cases of venous thromboembolism were analysed (table 4⇓).w8w14w20 The weighted mean follow-up was 4.7 years. 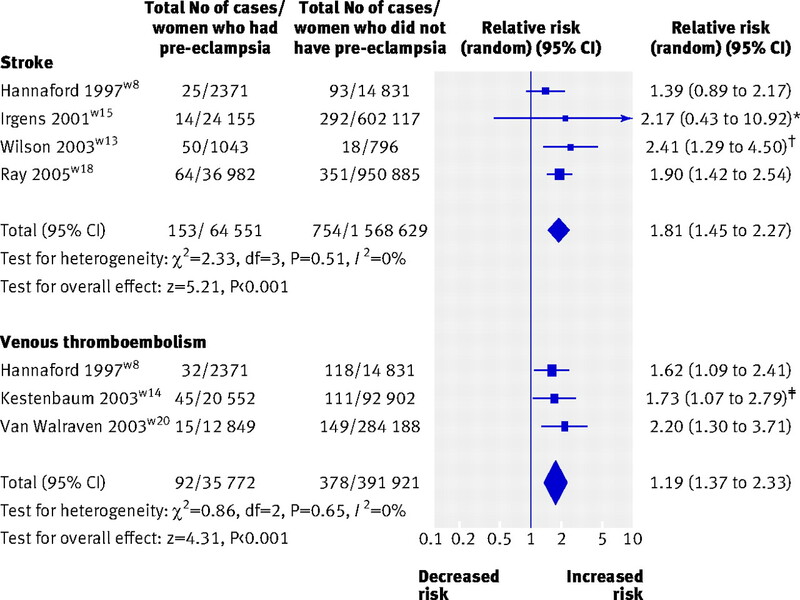 The risk of venous thromboembolism in women who developed pre-eclampsia was 1.79 (1.37 to 2.33) compared with women who did not develop pre-eclampsia. No heterogeneity was observed (P=0.65; I2=0%; fig 5⇑). 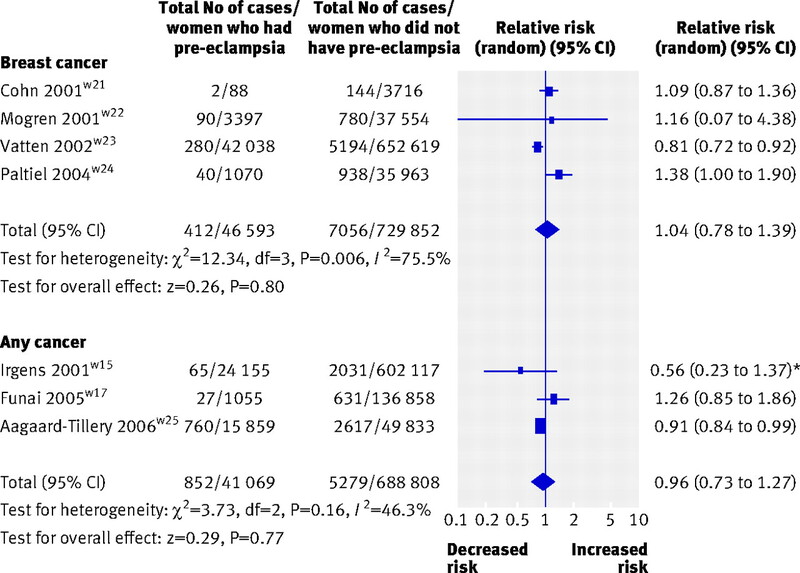 Three studies (729 025 previously pregnant women) were included involving 41 084 women with pre-eclampsia and 6131 incident cancers.w15w17w25 (table 6⇓). The average weighted mean follow-up for each woman was 13.9 years, excluding one studyw25 that presented a range of follow-up rather than a mean number of years. The relative risk of developing any cancer after pre-eclampsia was 0.96 (0.73 to 1.27). No evidence was found of heterogeneity (P=0.15; I2=43.2%; fig 6⇑) or of small study bias (Egger test, P=0.97). Four studies (794 462 women) included 49 049 with pre-eclampsia and 7537 women who later died from all causesw13w15-w17 (table 7⇓). The average weighted mean follow-up was 14.5 years for each woman. Women who developed pre-eclampsia had an increased risk of death from any cause compared with women who did not develop pre-eclampsia (1.49, 1.05 to 2.14). Heterogeneity was substantial (P<0.00001; I2=93.9%; fig 7⇓) and this was most noticeable between studies of early and late pre-eclampsia (P<0.00001; I2=96.5%). Women developing pre-eclampsia before 37 weeks' gestation had a relative risk of 2.71 (1.99 to 3.68) of death from any cause in later life compared with women who had normal blood pressure completing pregnancies.w15 No evidence of small study bias was found (Egger test, P=0.84). A history of pre-eclampsia increases the risk of future hypertension, ischaemic heart disease, stroke, venous thromboembolism, and death from any cause. The major contribution to all cause mortality seems to be cardiovascular disease, as there was no difference in the relative risk of death from breast cancer or any other cancers. It is possible that much of the excess risk of future ischaemic heart disease and stroke is explained by the link between pre-eclampsia and blood pressure.19 Most studies (12 of 15) only made adjustment for age, but three adjusted for diabetes mellitus, features of the metabolic syndrome, smoking, and socioeconomic status.w9w17 w18 In one of these studies that included over a million women the association between pre-eclampsia and future cardiovascular disease seems to be independent of prepregnancy hypertension, diabetes mellitus, obesity, dyslipidaemia, the metabolic syndrome, and smoking.w18 We found a similar twofold increased risk of cardiovascular disease in those studies with incomplete adjustment for established cardiovascular risk factors. Pre-eclampsia most commonly occurs during the first pregnancy. Women who had pre-eclampsia early (<37 weeks' gestation) in their first pregnancy were more likely to have recurrent pre-eclampsia compared with those who had pre-eclampsia late in their first pregnancy (>37 weeks' gestation). Recurrent pre-eclampsia compared with a single episode has been associated with a sevenfold increased risk of later hypertension.w3 We also found that pre-eclampsia in any pregnancy compared with pre-eclampsia in only the first pregnancy was associated with a greater relative risk of future hypertension. It is likely that women who have recurrent pre-eclampsia have an underlying pathological phenotype that puts them at risk of hypertension and cardiovascular disease. We also observed in the sensitivity analysis that women who had early pre-eclampsia had the greatest risk of future cardiovascular disease and this was higher than those who had “severe” pre-eclampsia. This observation was supported by tests of heterogeneity. It follows that the timing of onset of pre-eclampsia more accurately reflects the severity of the maternal cardiovascular phenotype than the severity to which pre-eclampsia may evolve, which more probably reflects the timeliness of antenatal observations. Most women in the studies in our review will not have reached the menopause by the time of follow-up, so their absolute risk of ischaemic heart disease is likely to have been low. A woman living in the United Kingdom aged 40-49 years and with an average level of risk factors for cardiovascular disease has an almost 4% risk of a cardiovascular event within 10 years (J Moon, personal communication, 2007). If the increased risk of cardiovascular disease after pre-eclampsia is independent of these risk factors this risk would increase to around 8% for an otherwise similar woman with a history of pre-eclampsia. Two reports included in our review followed up women for more than 20 years after pre-eclampsia and the data indicated that the twofold risk of later cardiovascular disease persists long term.w13w17 Since the risk of a cardiovascular event increases with age, absolute risk at age 50-59 years would be 8.3% and 17.8% for a woman without and with a history of pre-eclampsia and at 60-69 years would be 14.2% and 30.7%, suggesting that a woman with pre-eclampsia might become eligible for primary prevention at an earlier age.20 The matter of the independence of the effect of pre-eclampsia on cardiovascular risk could be dealt with by an analysis of data at participant level from studies that measured risk factors. Most populations included in the systematic review were of European origin, such as women from North America, Canada, and western Europe. It is possible that other ethnic groups will have different risk ratios for future cardiovascular disease. Women of Afro-Caribbean origin have an increased risk of pre-eclampsia,21 which may translate into a higher risk of future cardiovascular disease. The null association with cancer, a common cause of morbidity and mortality in later life, suggests the associations are specific to cardiovascular disease. This observation may indicate a common cause for pre-eclampsia and cardiovascular disease or a deleterious effect of pre-eclampsia on the maternal vascular system, or both. It is unlikely that our observations are the result of chance because of the large number of women included (>3.4 million) and the large number of incident cases. Furthermore, there was a strong consistency of the association between pre-eclampsia and future cardiovascular disease in different studies for most end points. The only outcome for which there was evidence of small study bias was incident hypertension (see bmj.com).29 Clear concordance was, however, found between the effect estimates of the largest studies included in the meta-analyses and the overall relative risks that we produced for each outcome. The effect estimate for incident hypertension after pre-eclampsia (relative risk 3.7, 2.7 to 5.05) could be an overestimation, and a relative risk less prone to bias would be the one obtained from pooling the largest studies—that is 2.37, 2.11 to 2.66. Assessing the quality of included studies is controversial. The application of a quantitative score of study quality as part of study selection in meta-analysis is a process that has not been validated and can itself introduce bias. To overcome this problem we evaluated relevant study characteristics that may introduce bias to the meta-analysis, and we used these characteristics in a sensitivity analysis (fig 4⇑). This approach indicated that the findings were robust. Most of the studied cohorts were retrospective, which limited our ability to assess adequately the effect of potential confounders on observed associations. Some women in older studies with pregnancy induced hypertension may have been misclassified as having pre-eclampsia, but when analyses were restricted to women with a clear phenotype such as severe pre-eclampsia, similar results were obtained. Furthermore, we showed that women who had pregnancy induced hypertension have a similar, but lower, risk of future hypertension and cardiovascular disease as those who had rigorously defined pre-eclampsia (see bmj.com). The WHO criteria for international classification of diseases were universally adopted for the diagnoses of all outcomes except hypertension. A minimum diastolic blood pressure of 90 mm Hg or the use of antihypertensives after the pregnancy with pre-eclampsia were used to diagnose hypertension. As included studies spanned more than 40 years, alterations in diagnostic criteria occurred, with reclassification (eight, ninth, and 10th revisions). This may not have affected the numbers of future events but may have increased the likelihood of misclassification. Since the overall relative risks were consistently increased for all cardiovascular outcomes, this possibility is unlikely. Women who have had pre-eclampsia have an increased risk of cardiovascular disease, including an almost fourfold increased risk of hypertension and an approximately twofold increased risk of fatal and non-fatal ischaemic heart disease, stroke, and venous thromboembolism in later life. This may explain the small increase in risk of death. The lack of association between pre-eclampsia and future cancer, in particular breast cancer, suggests a specific relation between pre-eclampsia and cardiovascular disease. The mechanism underlying this association remains to be defined, but whatever its nature a history of pre-eclampsia should be considered in the evaluation of women's risk of cardiovascular disease. If the risk proves independent of established risk factors for cardiovascular disease, affected women would be eligible for preventive therapies at an earlier age than usual. We thank the following authors for additional information: Phil Hannaford, Lorentz Irgens, Rolv Lie, Gordon Smith, Brenda Wilson, Carl Van Walraven, and Ingrid Mogren. Contributors: LB and DJW contributed to conception and design, analysis and interpretation of data, drafting the article and revising and were involved in the final approval of the version to be published. JPC contributed to the analysis and interpretation of data and revising of the article. ADH contributed to interpretation of the data, drafting and revising of the article and approval of the final paper. ADH has a senior fellowship funded by the British Heart Foundation. DJW had full access to all of the data in the study and takes responsibility for the integrity of the data and the accuracy of the data analysis. Roberts JM, Taylor RN, Musci TJ, Rodgers GM, Hubel CA, McLaughlin MK. Preeclampsia: an endothelial cell disorder. Am J Obstet Gynecol 1989;161:1200-4. Brown MA, Lindheimer MD, de Swiet M, Van Assche A, Moutquin JM. The classification and diagnosis of the hypertensive disorders of pregnancy: statement from the International Society for the Study of Hypertension in Pregnancy (ISSHP). Hypertens Pregnancy 2001;20:IX-XIV. Seely EW, Solomon CG. Insulin resistance and its potential role in pregnancy-induced hypertension. J Clin Endocrinol Metab 2003;88:2393-8. Ray JG, Diamond P, Singh G, Bell CM. Brief overview of maternal triglycerides as a risk factor for pre-eclampsia. Br J Obstet Gynaecol 2006;113:379-86. Greer IA. Thrombosis in pregnancy: maternal and fetal issues. Lancet 1999;10:1258-65. Redman CW, Sacks GP, Sargent IL. Preeclampsia: an excessive maternal inflammatory response to pregnancy. Am J Obstet Gynecol 1999;180:499-506. Bosio PM, Mckenna PJ, Conroy R, O'Herlihy C. Maternal central haemodynamics in hypertensive disorders of pregnancy. Obstet Gynecol 1999;94:978-84. Rodie VA, Freeman DJ, Sattar N, Greer I. Pre-eclampsia and cardiovascular disease: metabolic syndrome of pregnancy? Atherosclerosis 2004;175:189-202. Williams D. Pregnancy: a stress test for life. Curr Opin Obstet Gynaecol 2003;15:1-7. Milne F, Redman C, Walker J, Baker P, Bradley J, Cooper C, et al. The pre-eclampsia community guideline (PRECOG): how to screen for and detect onset of pre-eclampsia in the community. BMJ 2005;330:576-80. Makkonen N, Harju M, Kirkinen P. Post-partum recovery after severe pre-eclampsia and HELLP syndrome. J Perinatol Med 1996;24:641-9. Ruschtzka F, Schulz E, Kling H, Schrader J, Rath W. Longitudinal study of 24-hour blood pressure behaviour in pregnancy and the puerperium in patients with normal pregnancy, pre-eclampsia and HELLP syndrome. Z Geburtshilfe Neonatol 1996;200:100-3. Chesley LC, Annitto JE, Cosgrove RA. The remote prognosis of eclamptic women, sixth periodic report. Am J Obstet Gynecol 1976;124:446-59. Stroup DF, Berlin JA, Morton SC, Olkin I, Williamson GD, Rennie D, et al. 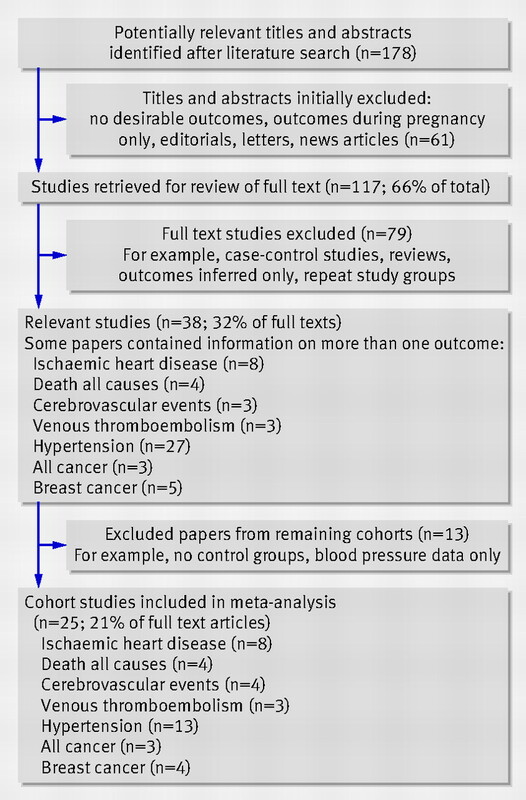 Meta-analysis of observational studies in epidemiology, a proposal for reporting. JAMA 2000;283:2008-12. Singh MM, Macgillivray I, Mahaffy RG. A study of the long term effects of preeclampsia on blood pressure and renal function. J Obstet Gynaecol 1974;81:903-6. Caughey AB, Stotland NE, Washington AE, Escobar GJ. Maternal ethnicity, paternal ethnicity, and parental ethnic discordance: predictors of preeclampsia. Obstet Gynecol 2005;106:156-61. Savvidou M, Hingorani AD, Tsikas D, Frolich JC, Valance P, Nicolaides KH. Endothelial dysfunction and raised plasma concentrations of asymmetric dimethylarginine in pregnant women who subsequently develop pre-eclampsia. Lancet 2003;361:1511-7. Chambers JC, Fusi L, Malik IS, Haskard DO, De Sweit M, Kooner JS. Association of maternal endothelial dysfunction with preeclampsia. JAMA 2001;285:1607-12. Lin J, August P. Genetic thrombophilias and preeclampsia. A meta-analysis. Obstet Gynecol 2005;105:182-92. Paidas MJ, Ku DH, Arkel YS. Screening and management of inherited thrombophilias in the setting of adverse pregnancy outcome. Clin Perinatol 2004;31:783-805. Herrmann J, Lerman LO, Mukhopadhgay D, Napoli C, Lerman A. Angiogenesis in atherosclerosis. Arterioscler Thromb Vasc Biol 2006;26:1948-57. Castles A, Adams K, Melvin CL, Kelsch C, Boulton ML. Effects of smoking during pregnancy. Am J Prev Med 1999;16:208-15. Hammoud AO, Bujold E, Sorokin Y, Schild C, Krapp M, Baumann P. Smoking in pregnancy revisited: findings from a large population-based study. Am J Obstet Gynecol 2005;192:1856-62. Peters JL, Sutton AJ, Jones DR, Abrams KR, Rushton L. Comparison of two methods to detect publication bias in meta-analysis. JAMA 2006;8;295:676-80.